Beyonce’s song “All The Single Ladies” has created several youtube sensations. This poor little boy had his dreams of being a single lady dashed by his father. The joy this kid gets from imitating his big sister just makes me smile. You may have already seen this, but I just had to share it with those of you who haven’t yet. It’s one disoriented kid after his first encounter with mind-altering narcotics at the dentist’s office. David (the kid) is still a bit woozy in the car before his dad starts the journey home. Their interaction is funny and charming as the elder assures his son that this wacked out version of reality is not a permanent state. My aunt is a teacher and frequently e-mails me funny tales that happen in her classroom or such stories she’s heard from other educators. 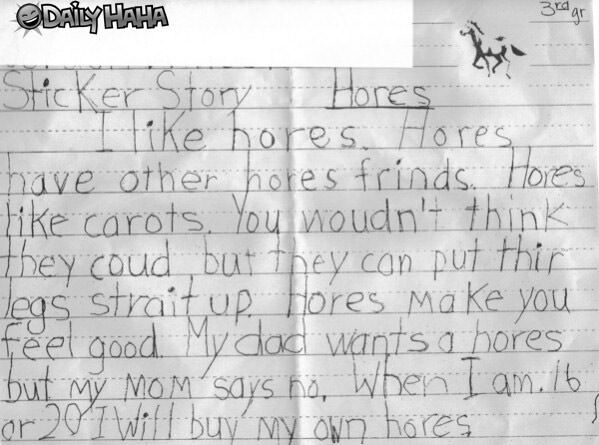 Today, she sent me this image of a third-grader’s story about a horse. Although, due to the transposition of two of the letters, horse turns into a completely different thing.